This is a ‘no nonsense guide’ to show you just exactly what your responsibilities are as a Director. So many people set up a Limited Company without knowing and understanding their obligations, we want to make sure that none of you fall foul of the law – ignorance isn’t a defence. Basically a Director has the legal responsibility to oversee the company and make daily decisions in it’s management – you have certain legal obligations. A limited company is a separate legal entity – something that new directors sometimes find hard to get their head around. As a separate legal entity the company has it’s own legal rights and any profits or losses belong to the company and not yourself. This applies even if you are the sole director or sole shareholder. Directors are employees of the company. Shareholders are the owners of the company. There are very few restrictions. If you are over 16, have no history of bankruptcy and haven’t been prohibited by a court order then you can be a director. You also don’t need to have any formal qualifications. 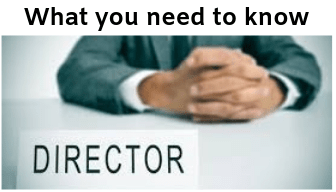 So, what are the duties of a Director? A director has legally enforced rules to abide by. Your duty to the company is the first thing to understand. The interest of the company comes first when making decisions and this still applies even if you are sole director/shareholder. Any decisions you make should benefit the company and not yourself. Again this can be confusing if you are sole director/shareholder but decisions should not benefit you personally over the company. You need to show reasonable care, skill and diligence – ie take advice if you don’t know. You must run the company in accordance with the ‘Articles of Association’. These are the guidelines you agreed to when incorporating the company. We see lots of people who have incorporated themselves and haven’t taken the time to read the articles of association or haven’t amended them to suit. You must avoid conflicts of interest. You have a duty to keep an honest and transparent record of the company’s accounts and these must reflect the company’s finances accurately. And you must not accept any benefits from third parties. Your decisions must be made independently to avoid accusations of bribery. You need to make sure that you report any changes of address or shareholders to Companies House and HMRC. As a Director you are responsible for making sure that all relevant taxes are registered for and that returns are submitted within the deadlines to HMRC and Companies House. Ultimately you are legally responsible for the accuracy of the returns. Be aware that the general public and insolvency practitioners can report you if they think you are using the company’s money or assets for personal use or if you are not declaring the right amount of tax that is due. Whilst trading through a limited company can have great benefits you must ensure that you understand all of the above. It is vital to keep a proper record of Board Meeting Minutes, Dividend Vouchers and Share Certificates – these can be forgotten if you are the sole director/shareholder but you need it all recorded properly to satisfy your legal responsibilities. Likewise it is vital to keep proper records of the finances. If you need any help or advice with anything contained in this guide then please get in touch. At Bowes Brooks we deal with the majority of this on a daily basis. We are happy to provide our offices as your registered address. And don’t forget that we are always happy to answer quick questions even if you aren’t a client so feel free to pick up the phone – we could answer in a couple of minutes something that is (or should be) keeping you awake at night.